MD Clean can offer distribution of high quality cleaning products and janitorial supplies to commercial establishments throughout the South East. Our extensive product range includes hand towels, toilet rolls, detergents, chemicals, window cleaning supplies, dispensers, dusters, wipes, hand sanitisers, dishwashing items, sponges, brushes and a host of other janitorial supplies. In partnership with third party companies we can offer an extensive range of feminine disposal units all provided with a tailor made service schedule. These products are delivered on time, every time; and the delivery schedule can be customised based on your unique requirements. Our purchasing capabilities ensure that we provide these supplies at competitive rates. Washroom cleanliness adds to the image of your work space and a clean space will eliminate germs and ensure overall hygiene. At MD Clean we only supply approved products that are safe and effective. Reliable delivery that ensures your washrooms is always stocked and ready. 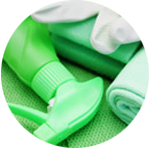 Wide range of cleaning products so you can receive all your supplies and janitorial products under one roof. High quality products from leading manufacturers to ensure complete hygiene and cleanliness. Customized delivery schedule that perfectly matches your commercial need. Simple and quick order process that will save you time and effort. Attractive rates as we work with a large network of leading suppliers to give you a price advantage. Choose janitorial supplies company with a proven track recordwith hundreds of satisfied customers throughout Kent and the South East. Contact us today to find out how we can help with your office cleaning requirements.